Funk guitar legend Leo Nocentelli will add his stellar chops to an all-star aggregation that comes together periodically to celebrate the funk legacy of New Orleans pianist, songwriter, producer, and vocalist Eddie Bo. 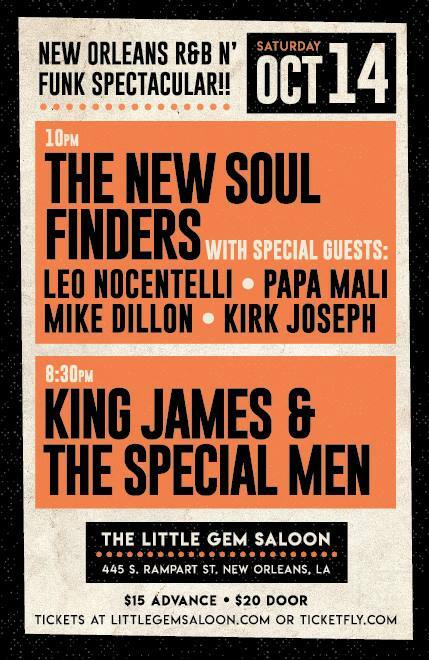 King James and the Special Men, another local ensemble in debt to the R&B greats of New Orleans, will kick the show off upstairs in the Little Gem Ramp Room. The New Soul Finders! feature Marilyn Barbarin—one of Bo’s primary vocalists during his funk period with the original Soul Finders. The new version of the band includes guitarist Marc Stone, bassist Reggie Scanlan, keyboardist Tom Worrell, and drummer Terry Scott, Jr. of Dr. John’s band. Special guests include guitarist and vocalist Papa Mali, percussionist Mike Dillon, and sousaphonist Kirk Joseph of the Dirty Dozen Brass Band. Next generation soul shouter John Paul Carmody will handle vocals as well. Like many musicians who grew up in New Orleans in the 1950s and 1960s, Leo Nocentelli has a history with Eddie Bo. Before he became a household name for creating such Meters classics as “Cissy Strut” and “Sophisticated Cissy,” he cut his teeth performing live with Eddie Bo. He also worked as a session guitarist for New Orleans’ premier producer/composer Allen Toussaint. Though Bo never received the widespread acclaim accorded to Toussaint, he helped lay the foundation of New Orleans funk and soul prior to the avalanche of the Meters’ Toussaint-produced funk masterpieces. His singles from this period are much in demand by collectors worldwide. The all-star gala is partly a celebration of the New Soul Finders! debut at the Crescent City Blues and BBQ Fest. They will play on Sunday, October 15 at 1 PM in Lafayette Square. Show time is 8 PM. Tickets are available here.